Luc Brahy, born in 1964, has always been fascinated by art and adventure. At only two and a half years old, he gravitated toward comic books, and it wasn't long before he was devouring Hergé and Hugo Pratt, and other novelists including Arthur Conan Doyle, Edgar Allen Poe, and Ernest Hemingway. As an adult, he quickly got a foot in the publishing world through advertising and press illustrations, and it wasn't long before he crossed paths with Frank Giroud, with whom he would go on to publish Zoltan (Vents d’ouest, 1994). He later met author Éric Corbeyran, another important encounter for the young artist, and they teamed up on a number of projects, including Imago Mundi (Dargaud, 2003). Over the ensuing years, Brahy went on to establish a variety of successful collaborations, on such series as Insiders Genesis (Dargaud) and Mission Osirak (Dargaud). 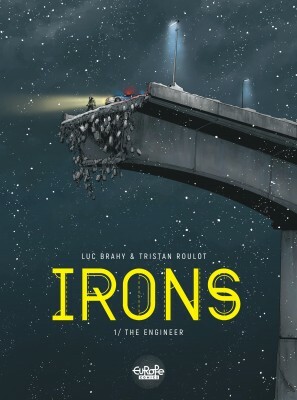 His most recent work includes the series Irons (Le Lombard, Europe Comics in English), created with Tristan Roulot, which tells the story of the sarcastic and brilliant engineer Jack Irons.